This rare tropical fiord is now recognized as one of the most extraordinary marine environments in the world! 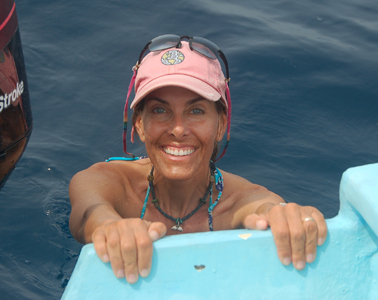 In 2010 and 2011, Brooke Bessesen and research assistance/ boat captain Jorge Largaespada conducted a marine sighting survey that gave rise to profound scientific discoveries. Enjoy photos and blurbs below. Bessesen developed the online database GolfoDulce.org in 2015 to make peer-reviewed articles from a broad array of biologists available to Costa Rica's conservation organizations and policy makers. In 2017, she returned to Golfo Dulce to gently catch, measure and release dozens of venomous yellow sea snakes for a morphological and behavioral study. Cumulative data allowed Bessesen and co-author Gary J. Galbreath to name the subspecies Hydrophis platurus xanthos. This taxonomic designation—which received global media coverage—is hoped to provide foundational footing for the protection of the snakes and their habitat. Hydrophis platurus xanthos assumes a unique sinusoidal ambush posture, which appears to make its body like a buoy in rough water. Hanging its head allows it to access fish below the surface. Read articles about xanthos in Newsweek, Science News, and The Wire. 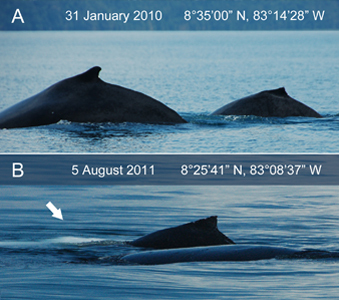 Golfo Dulce is a rare birthing ground for humpback whales from both the northern (top) and southern (bottom) hemispheres. In the bottom image, milk whitens the water as a young calf nurses. 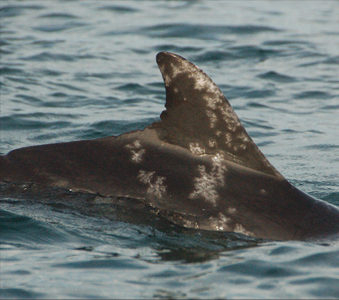 Read Brooke's essays: "A Humpback Whale Hotspot" and "Nature is a Mother"
Expert examination of these strange skin lesions revealed that some of Golfo Dulce's resident bottlenose dolphins suffer a chronic disease called LLD, likely related to water degradation. Read Brooke's related essay: "Photo-identification of Bottlenose dolphins". Several hundred green sea turtles (as well as critically endangered hawksbill, Olive Ridley's and Pacific leatherback sea turtles) depend on the waters of Golfo Dulce. 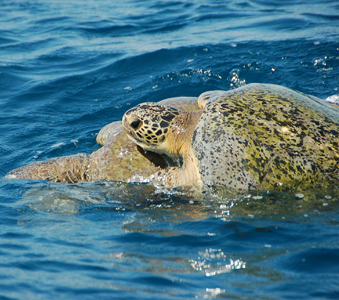 Read Brooke's essay: "So Many Sea Turtles". 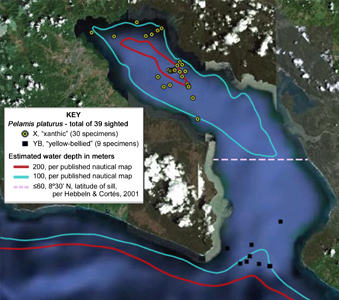 In 2010, plotted sighting points first revealed a geographical gap between typical yellow-bellied sea snakes and an all-yellow population inhabiting the inner-basin waters of Golfo Dulce. 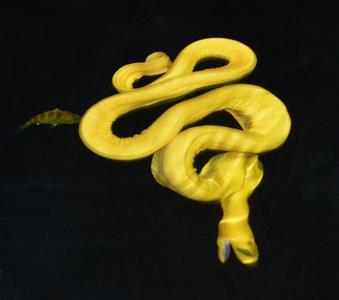 Read Brooke's essay: "Canary-colored Sea Snakes". 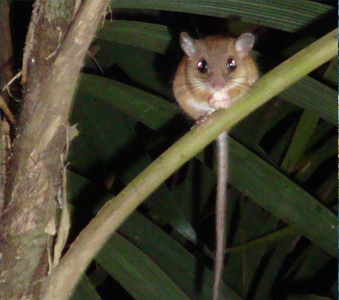 Coming upon a hungry rodent in the nighttime rainforests of the Osa Peninsula expanded our scientific understanding about the diet of vesper rats. Read Brooke's Blog: "Scientific Paper in Brenesia".